The bitmap is scanned multiple times, each time with a different setting. One path is created for each scan. The paths are stored in a group. The scanning criteria can be Brightness, Colors, or Grays. Grays uses the Color scanning criteria but assigns the resulting paths a grayscale rather than a color. The Scans entry box applies to all three scanning criteria. Three options, described in the Options section below, apply to all Multiple Scans. The bitmap is scanned one more time than the specified number (Bug?). The values at which the scans are performed is nontrivial. The lowest (darkest) scan is always done at a brightness threshold of 0.2, the next scan is at a threshold of (0.2 + (0.9 − 0.2)/n). The output level of the darkest region is 0.2 and the lightest is 0.9. Other regions fall at evenly spaced positions in between. If the Remove background box is checked, the 90% region is removed. Multiple scans using the Brightness option. From left to right, there are 2, 4, and 8 scans. Multiple scans using the Brightness option. From left to right, there are 5, 10, and 15 scans. The image is traced into the specified number of paths via the following procedure: The number of colors in the bitmap is reduced to the value in the Scans entry box using an optimal set of colors chosen via the Octree Quantization method. 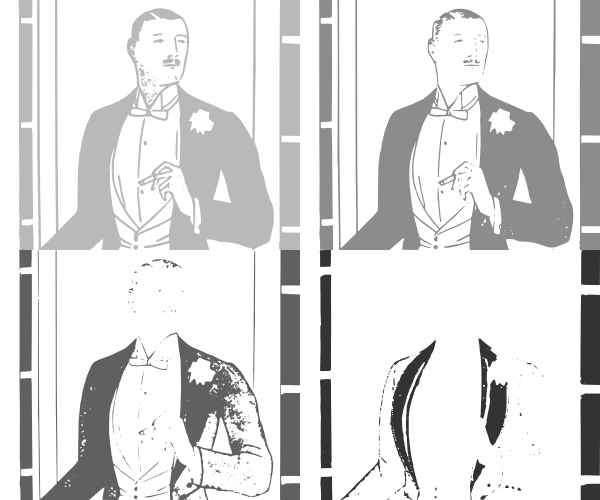 A black-and-white bitmap is created for each color, which is then sent to Potrace for tracing. Multiple scans using the Colors option. From left to right, there are 2, 4, and 8 scans. Multiple scans using the Colors option. From left to right, there are 5, 10, and 15 scans. The tracing principle is the same as for Colors but the result is turned into a grayscale image. Multiple scans using the Grays option. From left to right, there are 2, 4, and 8 scans. Multiple scans using the Grays option. From left to right, there are 5, 10, and 15 scans. Three extra options are available with Multiple scans. Smooth. Selecting the Smooth causes a Gaussian Blur to be applied to the input bitmap before tracing. This has the effect of smoothing out the difference between adjacent pixels and can be very useful, for example, with scans of screened prints. Too much filtering can lead to loss of detail. 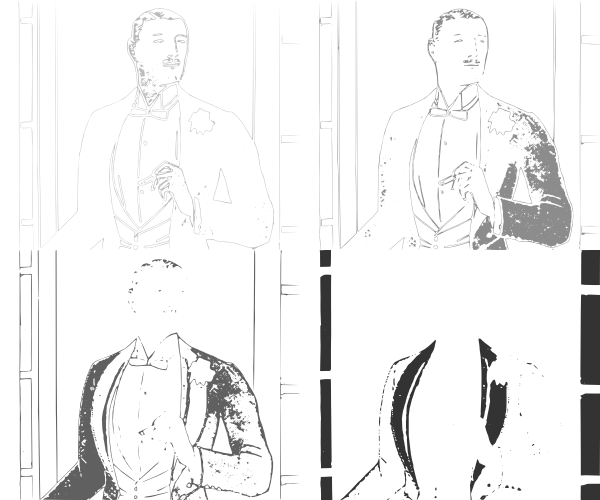 The preceding tracings were made without smoothing as the input scan had already been filtered with a Gaussian blur in Gimp. Stack scans. The Stack scans option determines how the paths are defined. With the Stack scans box unchecked, the paths produced do not overlap; with the box checked, each path includes the area of the paths above it in z-order. The advantage of unstacked paths is that they are easier to divide into sub-paths, while the advantage of stacked paths is that there are no “holes” between the coverage of the paths. The differences between the two situations is depicted below. The four paths from a multiple scan with the Stacked box checked. The four paths from a multiple scan with the Stacked box unchecked. Remove background. The lowest path in z-order is defined as the background. Normally, this path has the lightest color. When the Stack scans option is chosen, the background path corresponds to a rectangle the size of the scanned image. Checking the Remove background box prior to scanning suppresses this path.